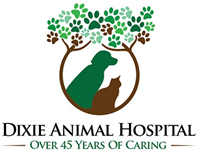 Our mission is simple…Dixie Animal Hospital will focus on your pet partner and you, our client, by providing compassionate, personalized quality veterinary care in an atmosphere of concern and well-being. Dixie Animal Hospital will customize services to aid you in routine preventive care from your pet’s youth throughout his or her life cycle and by promoting and providing early detection and treatment of disease, as necessary, to maintain a quality of life beneficial to your pet. Services Well Care, Surgery, Boarding,Grooming, Digital X-rays, Ultrasound, Prescription Foods, Dentistry, Blood work, Bathing, De-ticking, Skin problems, Flea and tick prevention, & Heart worm prevention.